This years Sillosocks Specklebelly (AKA Speck or Whitefront) print is the best ever! It is the perfect brown color with tan feather highlights. These windsock decoys are dead flat and do not shine. These Speck Feeder Goose Windsock Decoys (SS1098) by Sillosocks Decoys come with flocked heads and UV correct white nose patches. This is a great decoy that can be used alone or mixed in with other decoys to add movement. With just a 1 mph breeze, these decoys "start to dance". These Speck Feeder Goose Windsock Decoys (SS1098) by Sillosock Decoys feature tyvek bodies that do not shine! They also come with a "inner liner bag" that gives the body support in "no wind" situations. They come with a 20" HOOKED spring steel ground stakes. It is a great improvement when picking up. Fully powder coated stake will not rust! We recommend that you do not glue the stakes in so you can adjust the height of your decoys according to the field you are hunting and the wind conditions. In low fields or high wind conditions, slide the decoy down the stake so that the body touches the ground. This will stop any excess movement. These decoys also work on Greylag Geese, Pinkfooted Geese, and Bean Geese. 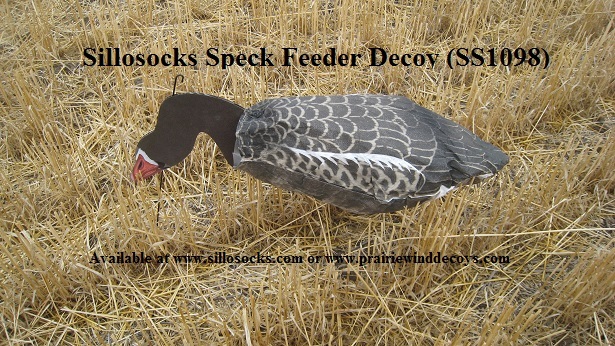 These Speck Feeder Goose Windsock Decoys (SS1098) by Sillosocks Decoys will help you be more successful! **SALE** Normally $80/dz, NOW $74.95/dz!! PLUS GET FREE SHIPPING!! **SALE** 12 dz. SPECIAL CASE PRICING!!! BUY IN BULK AND SAVE! PLUS GET FREE SHIPPING!